If your Thanksgiving plans include a California getaway over the four-day weekend, these are some ideas and some things to do that happen during the holiday. Thanksgiving weekend is a great time to rent a vacation home and get the whole clan together, whether they're related to you by blood or just your closest friends. It's best to reserve ahead of time, but these ideas may help you find a place to go if the obvious ones are filled up. If you want to get together in the mountains, it may be impossible to find a place that fits your whole family in places like Lake Tahoe which are close to the most popular ski areas. Instead, try Pine Mountain Lake near Groveland and Yosemite National Park. For a family break at the seashore, try a vacation rental at Irish Beach just south of Mendocino, Dillon Beach north of San Francisco, or visit HomeAway which has lots of vacation rental listings all over the state, even in the cities. Hollywood Christmas Parade: The Hollywood Christmas parade is held on Thanksgiving weekend. It's a long-time tradition that seems less glamorous and more hometown-like than you might expect. Turkey Trot: Get a head start on burning off all the excess calories with a Thanksgiving morning run in Long Beach. You can also take a vegetarian-themed run at the Tofurkey Trot in Pasadena. The Christmas season kicks off in earnest right after Thanksgiving, and there's no better way to switch gears and get into the seasonal mood than the LA Zoo Lights, which start the Friday before Thanksgiving. Downtown on Ice: Just before the Thanksgiving holiday, Downtown's Pershing Square sprouts an outdoor ice-skating rink. Thanksgiving Lunch at the Aquarium of the Pacific: The people get a traditional holiday buffet, and you can see what the fish and other sea creatures are up to afterward. Major Tourist Attractions: Most of them will be open, even on the holiday, including the theme parks. Expect them to be packed, with some of the year's largest crowds. Holiday Movie Viewing in a Palace: Thanksgiving marks the beginning of the holiday blockbuster movie season. Why not make a special event out of one of them, going to Grauman's Chinese, El Capitan or the Arclight Cinema to see it amidst lavish surroundings? Father Joe's 5K Run: It starts in Balboa Park and helps Father Joe provide more than a million meals every year to people who need them. 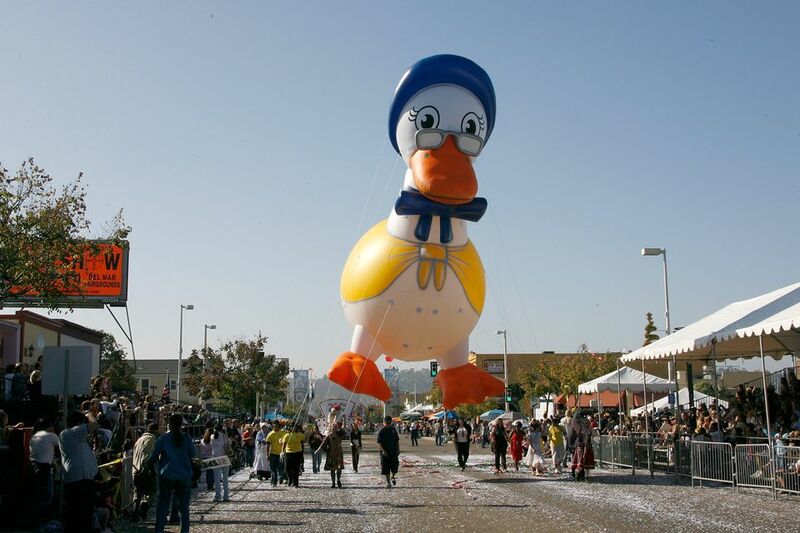 Mother Goose Parade: The town of El Cajon has been celebrating at Thanksgiving for more than 60 years, and many locals consider this charming parade the unofficial start of the Christmas season. It's held the weekend before Thanksgiving. San Diego Jazz Festival: The five-day festival runs the entire Thanksgiving weekend. Turkey Trail Trot gives a chance to burn off some calories before you consume them, but you'd better register early - they sometimes fill up. The Dickens Fair gets underway at the Cow Palace and runs every weekend through December. It's a festive way to switch gears into the Christmas season, with an old-fashioned holiday spirit that would have Ebenezer Scrooge shouting "Bah! Humbug!" until he lost his voice. Tree Lighting ceremonies start the shopping season at Union Square and Pier 39. The Embarcadero Center holiday lights go on a week before Thanksgiving, outlining the waterfront buildings through December. The holiday ice rink at Union Square opens even earlier, but both are in full swing for Thanksgiving weekend. The San Francisco Auto Show runs over Thanksgiving weekend, giving you a chance to salivate over something other than that big plate full of holiday goodies - and a good place to walk off some of those calories. Thanksgiving often marks the opening of ski season, as Lake Tahoe ski resorts compete to open by the holiday - even if they have to make all their snow to do it. Tioga Pass through Yosemite usually closes because of snow before Thanksgiving, but in some years it stays open through December, providing a chance for a late-year trip across the mountains. Sequoia National Park is home to the nation's Christmas tree, the General Grant. It doesn't get decorated with lights, but when you stand 267 feet tall, you don't need lights to be spectacular. In San Jose, Downtown Ice opens, and Christmas in the Park lights up the day after Thanksgiving. The Holiday Lights Train starts running from the Santa Cruz Beach Boardwalk on Thanksgiving weekend. It's a great way to start the holiday season.